Baobab trees are silhouetted at sunrise in Tarangire National Park, Tanzania. The world is jam packed with bad news. It’s like traffic, sometimes you just can’t avoid it. But there is the road less traveled. If you follow this road it will reveal a spellbinding landscape: devoid of plastic, litter, smog and clouds of disappointment. 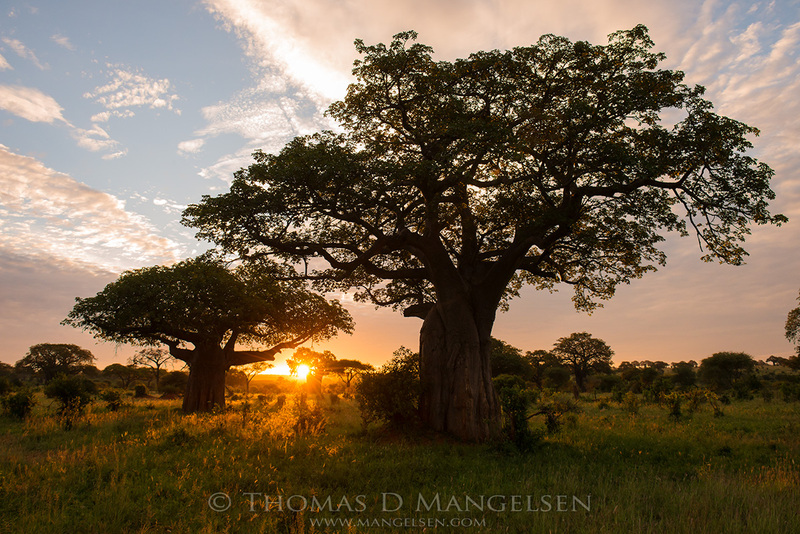 The natural world is medicine, and last month while on an assignment in Africa with legendary wildlife photographer Thomas D. Mangelsen, I tasted the antidote to ‘the black hole,’ served with a sprinkle of wonder. 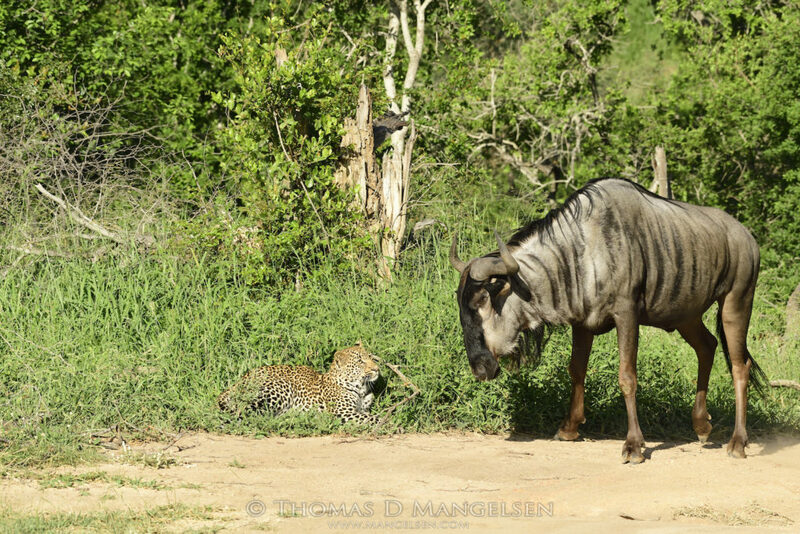 As each wildebeest walked past the big cat it would almost trip over him, and then continue walking, without even so much as a heads up to his buddy behind him. Eventually after the last tail passed by and they began to make their way across a grassy plain, the leopard jumped up and gave chase. The wildebeests decided now would be a good time to run, but it was more of a taunt than an attack. And after a while they went their separate ways. By the end of mine and Tom’s week long ‘stalking black rhinos’ assignment we both felt a much deeper appreciation for this incredible, rare species. 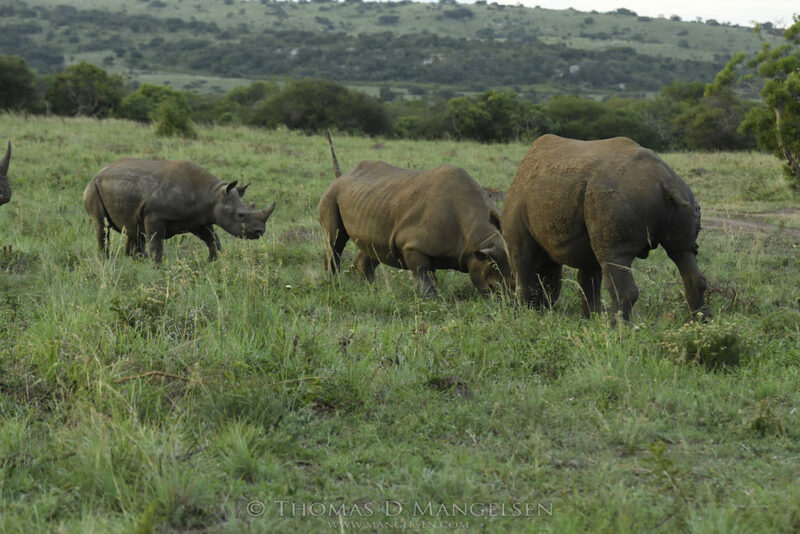 The black rhinos are curious and unpredictable with a boss attitude that extends to both genders. It was our first day at Phinda that we saw the stand down between cow and bull. The bull had already displayed quite the show for us, flehming for some ten minutes – the act of seeking out the scent of a female as he tilts his head high and curls his lip – and then marking his territory by spraying urine on the bushes. But this was not the day the bull was to get lucky. When we spotted the cow in the distance with her two young calves there was a concern that the bull might have a go at them. Not a chance! The cow, much smaller than the bull, switched to offense mode as soon as she spotted the threat she rushed at him like a fearless warrior, with her offspring in tow. A clash of horns and sinew, and grass tore beneath their hooves. Moments later the bull ran away into the thickets. Time stood still as we watched the mother and her two calves survey their land, heads held high and proud, the golden hour casting its glow across their armor skin. 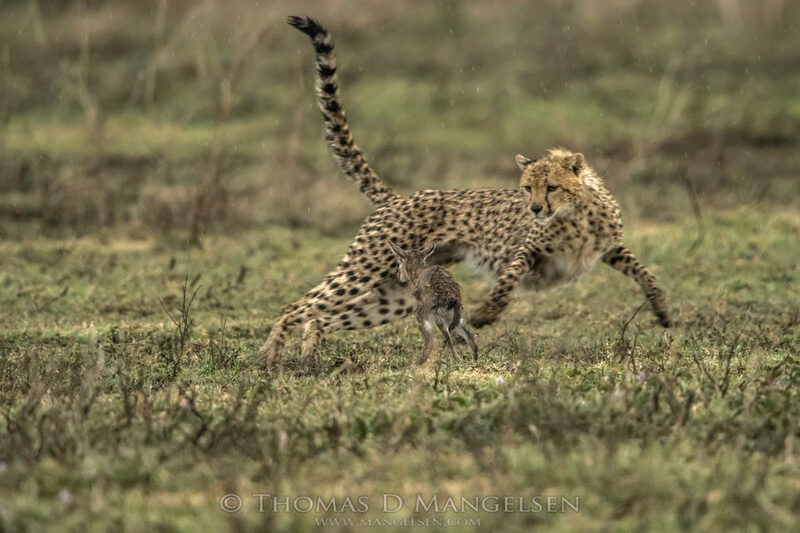 Tom spotted a cheetah with a new born Thompson’s gazelle, toying with it and playing ‘cat and mouse’ for over an hour. The baby gazelle even tried to nurse the cheetah. The newborn was likely imprinted on the unknown enemy. All this playing is thought to bring the mother gazelle back in range after seeing and hearing its fawn crying; baby bait one might say. The mother didn’t show and the cheetah made a meal of the gazelle. This is the brutal poetry of nature, the battle for survival. But the war on wildlife is a war of greed, engineered through status symbols and relentless savagery. We are down to the last of the leopards, rhinos, cheetahs, and the list goes on and on…but united, we can still save this vanishing wild for the next generation. 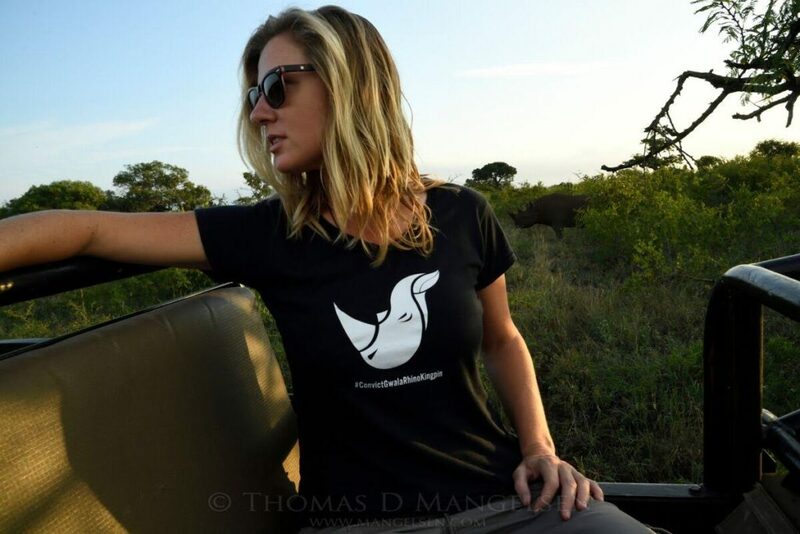 We can’t all travel to Africa and volunteer for wildlife preservation programs, but we can all share photographs and stories that inspire and educate, and we can all leverage off our own social networks to remind the world that what we stand to lose is priceless. 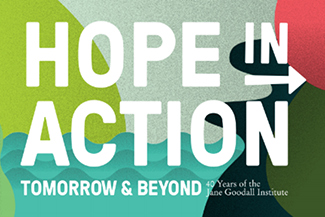 Sign JGI’s petition to help end wildlife trafficking and find out more about our conservation programs here.